oktober 2008 | 144 blz. 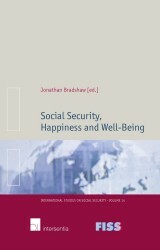 This book addresses the following questions: • Does welfare state effort enhance happiness? • Why might social security enhance happiness? • How might it be reformed to make more impact on well-being? • How does income and health impact on well-being? • How does income improve the well-being of widows? • Does well-being influence employment probabilities? • How is the well-being of children related to other factors in society?